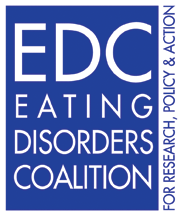 Eating Disorders Coalition: What Policy Changes Should We Focus on in 2019? The EDC is committed to gathering input and perspectives of our valued stakeholders on policy related issues and ideas. Over the last ten years, the EDC has sought your input in a variety of ways – phone conferences with members to seek feedback, social media dialogues seeking input into policy related actions and needs, public forum town halls at eating disorder conferences, dialogue and brainstorm sessions with leadership from other eating disorders organizations, expert analysis of likelihood of success regarding potential policy approaches, consultation with Hill staffers and legislators on priority areas, and electronic surveys like this one seeking feedback from EDC members and the broader community. For example, The EDC held Town Halls at the NEDA/BEDA Conference in November 2017 and the ICED Conference in April 2018, seeking input for the EDC 2019 policy priorities. Policy needs were on each agenda of the Eating Disorder Leadership Summit meetings between January 2016 and Spring 2017. An advocacy subcommittee made up of leadership from each eating disorder organization active on Capitol Hill met regularly during this time as well, to further discuss advocacy needs of the field and strategize options and opportunities for forward movement related to the needs of the field. EDC policy surveys were sent to EDC members and the public in 2016 to seek input for the 2017 Policy Agenda (https://www.surveymonkey.com/r/EDCMemberSurvey - opened 10/19/2016 and https://www.surveymonkey.com/r/EDCin2017). Now with this new survey, which we began developing in April 2018, we are seeking your valuable input on what you would like to see among the EDC policy priorities for 2019. Please take a few moments to respond to our survey at the link below and let us know what you think!